Hello everyone! It has been a busy week both at work and in craft. I can't believe how nice it is to be back on daylight. I had a bit of a blip this week cause I couldn't sleep Sunday night and as a result worked from home on Monday. I got all of the blocks DONE and the Horizontal Joins are all DONE!!!! (And the peasants rejoice!) This is a serious accomplishment and now to do the rest of the seams and get the border done. 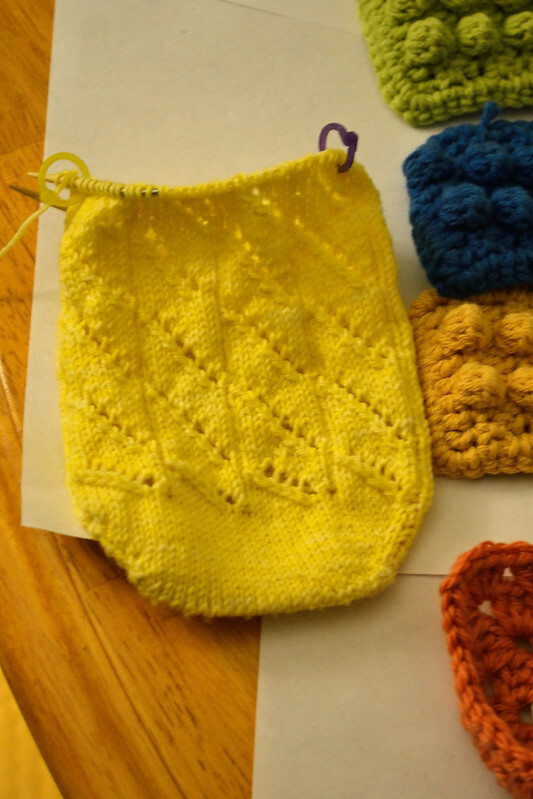 The socks are coming along and I started the gusset. I am really annoyed because I wanted to get 1 sock done last week but I keep working on them. Overall the progress is pretty substantial and I can't wait to finish since I see the light at the end of the tunnel for both of these projects. Thanks I really like it too! The colors are so great together. I love that Lego blanket! Thanks. 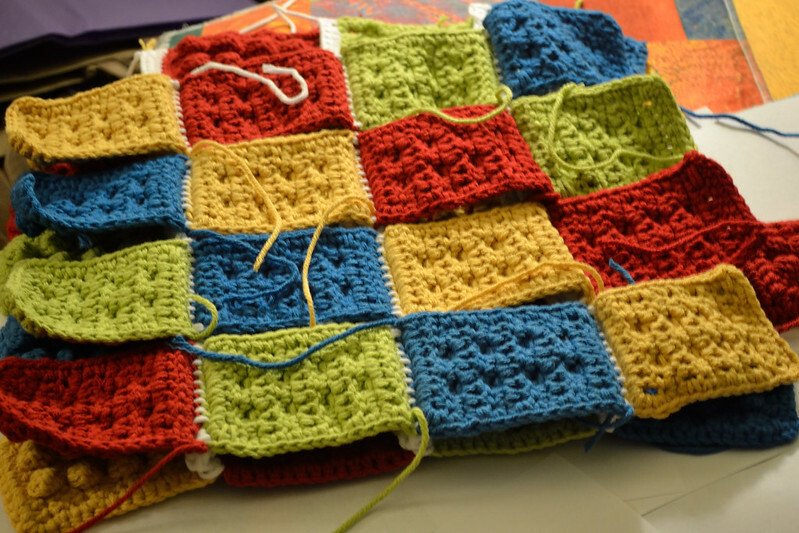 I hope to have a completed blanket within the next 2 weeks so stay tuned! The Lego blanket is going to be so awesome when you finish. Can't wait to see it. Thanks! I hope to get it done within the next 2 weeks. Getting close to finishing that blanket is SUCH a huge accomplishment, be sure to pat yourself on the back! I see so many blankets that get started and just don't make it (I'm guilty of this for sure), I'm so glad that yours worked out! Thanks. I think it helps that I really like the family this is going too and really the blocks weren't to big so I didn't get bored. Thanks I hope to have it done within the next 2 weeks. That is one awesome blanket! I love the colors. I don't think I would have the patience to do the assembly though. Thumbs up ! I think by putting it together while working on the last color has made it all more bearable. The socks are seriously flying I am almost at the heal turn now. The blanket looks so awesome so far! That lego blanket is so cute! !